Do you apply more fertilizer than necessary on your lawn? Your soil can be tested by the local Clemson Cooperative Extension office. The results of the test will tell you if your lawn has enough nutrients already stored in the soil to maintain a healthy lawn. By knowing this information, you could save yourself some money and help the environment! If you do need to amend your lawn with nutrients, read the directions. You may be applying more fertilizer than needed, and the excess nutrients end up in our lakes and rivers and lead to algae blooms and often to fish kills. Do you pick up after your pet? Fido's waste contains harmful bacteria that affects our drinking water supplies. Plus, nutrients in the waste also add to potential algae blooms in our lakes. As for managing waste in your yard, there are several solutions - flushing it down the toilet or purchasing/making a doggie loo or pet waste digester. Do you wash your car in the driveway? Consider washing your car on the lawn instead. In this way, the runoff that includes soap and dirt infiltrates and is treated naturally by the environment. You will also minimize the runoff that goes to the storm drain and flushes directly to our lakes, rivers, and estuaries. There are also low-phosphorus, biodegradable soaps that can be used that will do less harm to the environment. Are you sweeping grass clippings and leaves into the street or storm drains? Grass and leaves take time to decompose and can cause clogs in drains and outlets causing backups and flooding. The nitrogen and nutrients in these materials can also harm the natural balance in waterways. There are several alternative solutions for what to do with leaves and clippings such as bagging them for recycling, using a mulching mower to spread them on your lawn as natural fertilizer. or placing them in a compost pile to speed the macrobial process. Are you checking your car for leaks? Leaking antifreeze and other chemicals wash directly off our road surfaces to the local waterway. And, you can imagine how these unnatural chemicals can affect water quality and ecosystem quality. 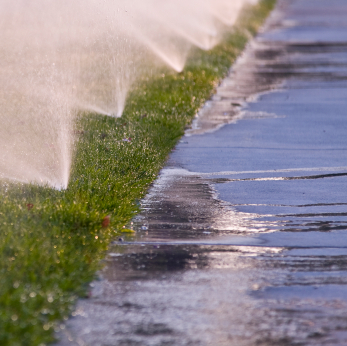 Are you over-watering your lawn and garden? When soils are saturated, the extra irrigation water can not be absorbed into the soil; instead is washes off to...you guessed it! It ends up in our nearby waterways, carrying with it sediment, oils, bacteria, metals, nutrients, and anything else that runoff picks up along the way! Have you considered using pervious pavers, stone paths, and other more natural means for walkways, driveways, and patios? Concrete and asphalt increase your impervious footprint, whereas pervious pavers allow for infiltration. The Carolina Clear NPS Toolbox has more materials, fact sheets and information on these topics above as well as Rain Gardens and Rain Barrels. You may also want to consider the tools and information available in the Carolina Yard & Neighborhood workbook! More information can be accessed by clicking HERE to go to the Carolina Yard & Neighborhood website. Do you have a rain barrel? Conserving water decreases the amount of run-off. Watch an introductory video below on the Carolina Clear 'Make Your Own' Rain Barrel Workshops.